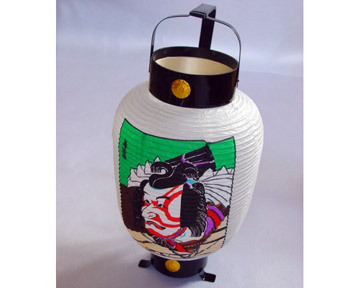 A colorful ukiyoe design of a kabuki actor graces this handmade paper lantern. A colorful ukiyoe design of a kabuki actor graces this handmade paper lantern. A beautiful decorative piece for any room. Ukiyoe (pictures of the floating world) originated in the 18th century, and the vivid images of geisha, kabuki actors and famous figures became quintessential symbols of Japan.